A police vs. serial killer procedural thriller that expands its scope to encompass widespread moral decay, Seven is a grim, grimy glimpse into dark corners of human sociality. Progressing along a path paved with clever tortures, bookish obsession, and weary cynicism about the nature of man, it veers onto a superhighway of gut-wrenching moral dread at its climax. This sudden turn almost takes it into the aesthetic ditch, but the production and performance quality keeps it steady. Its plot and concept is simple but ideologically and narratively rich. A serial killer is on a mission in an unnamed and decrepit metropolis (the movie was shot in L.A., but New York City is the more obvious corollary, and indeed was the urban inspiration for Andrew Kevin Walker’s remarkable screenplay). He is targeting and ritually killing apparently unconnected victims on the basis of the Catholic ethical tradition of the Seven Deadly Sins: Gluttony, Greed, Sloth, Lust, Pride, Envy, and Wrath, in succession. Two detectives are assigned to the case after the first killing, a murder by forced feeding: dignified soon-to-retire veteran Somerset (Morgan Freeman) and brash, freshly-transferred Mills (Brad Pitt). Somerset, a well-read amateur scholar, suspects the liturgical bent very early on, and converts Mills to his view after subsequent murders leave less and less doubt about the motive. He also gains a fond ally and confidant in Mills’ wife (Gwyneth Paltrow), who shares Somerset’s lack of faith in urban mores and entrusts him with an important secret. As Mills and Somerset get deeper into the case, both the killer’s symbolic project and the detectives’ involvement in it becomes grander, more baroque, more challenging to moral codes, and more viscerally, terribly personal. Like other notable films of the early part of director David Fincher’s feature career like Alien 3 and Fight Club, Seven physically manifests the auteur’s abiding interest in mankind’s quotidian cruelties with an exquisitely repulsive appearance and mise-en-scène of threatening, decomposing environments. A twisted, ugly exterior setting as a reflection of a similarly damaged psychological interior is Expressionism at its most basic, and Fincher’s early works are the Expressionist documents of a young iconoclastic artist, hungry to make meaningful and provocative film art. It’s a statement of Fincher’s maturation as a filmmaker that his more recent films (The Social Network most notably) have traded in the dirty veneer for antiseptic surfaces and clean-cut privilege, demonstrating a keener awareness that evil is often not innately visually unsightly. He even anticipates the soundscapes of his most recent work, utilizing a remix of Nine Inch Nails’ “Closer” over the opening credits (Trent Reznor later scored The Social Network and The Girl with the Dragon Tattoo with collaborator Atticus Ross). Mills, of the five-o’clock shadow, unkempt suit, and pack of pet dogs, is more at home in this sort of environment than his pale, fragile wife or his venerable partner. Little wonder that he gets drawn fatefully into its traumatic consequence while Somerset, with his nocturnal library privileges and bedside metronome, holds himself at a relative remove. Pitt and Freeman are wonderfully matched; the former was a fascinating physical actor even in his relative youth, and here his entire self is visible in the motions of his body at all times, while the latter’s stately grace and understatement lends him to internalized characters of considerable subtlety. Mills and Somerset make for one of the great onscreen police duos in recent memory. Seven is more than a genre exercise, of course, but really only just. Walker’s script adorns the police procedural thriller with decaying nihilism and obstinate scholarship, but his clever (too clever?) twist on the murderer-philosopher (who could only be played by Kevin Spacey, the apex predator of the well-spoken menacing creep role in the middle of the ‘90s) reaches at rendering the film worth remembering and worth discussing, if only at the bar with your buddies after the credits have rolled. For Walker and Fincher come to a conclusion that is perhaps not as provocative as they believe it to be: human beings are so debased, so morally empty, so irrevocably fallen, that only acts of unsurpassed cruelty can rouse them from their degenerate slumber. It’s a cynical view (and one ripped straight from the pages of vintage Alan Moore comics), and it’s skillfully fleshed out by writer and director. 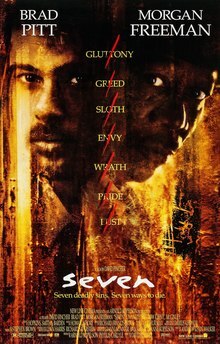 Seven may ultimately be a better film at its technical and visceral levels than at its intellectual level, but at least it manages to operate on all of these levels. Many films of its type can barely manage one such dimension, let alone all of them, and that’s worthy of note. will forward this information to him. Fairly certain he’s going to have a great read. I appreciate you for sharing!